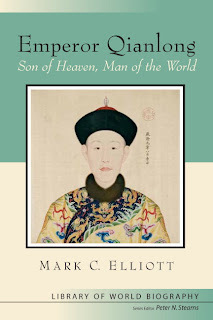 This new entry in the Longman Library of World Biography series offers an intimate and provocative account of the Manchu emperor Qianlong (1711-1799), one of the world’s great empire-builders, who helped build the foundation of the modern Chinese nation. During the 64 years of Qianlong’s rule, China’s population more than doubled, its territory increased by one-third, its cities flourished, and its manufactures — tea, silk, porcelain — were principal items of international commerce. Based on original Chinese and Manchu-language sources, and drawing on the latest scholarship, this is the biography of the man who, in presiding over imperial China’s last golden epoch, created the geographic and demographic framework of modern China. This accessible account describes the personal struggles and public drama surrounding one of the major political figures of the early modern age, with special consideration given to the emperor’s efforts to rise above ethnic divisions and to encompass the political and religious traditions of Han Chinese, Mongols, Tibetans, Turks, and other peoples of his realm. In addition to becoming familiar with one of the most remarkable figures in world history, readers will find that learning about Emperor Qianlong will add greatly to their appreciation of China’s place in the world of the eighteenth century and will deepen their understanding of China’s place in the world today.